I am quite a good example of social mobility. My parents only completed obligatory school – that was four years in rural Portugal in the 1950s – and started working at 12. They moved to France and then Switzerland in the 1970s, and worked their whole lives in unskilled jobs. In spite of that, I went to university, obtained a doctorate and have now a permanent academic position in a highly-ranked university. However, this upward mobility was only made possible by certain conditions. I grew up in Switzerland, where the quality of education was probably much better than what it would have been if my parents had stayed in Portugal. I grew up in a relatively wealthy village with a library just down the street, that I would visit at least twice a week to refill the comics and books that I didn’t have at home. Most importantly, I grew up in a country where everybody goes to state schools, and where there is no choice in selecting your school. Social reproduction is obviously present, but there is no stigma attached to state schools, as is often the case in Britain. Actually, it may be the contrary. The only people I know who would go to private schools would typically be children of wealthy parents who didn’t make it in the state system. If their grades weren’t good enough to go to the higher tier of the state system, their parents would place them in a private school with classes with only 5 pupils and tutorials to hold their hand until university. Same for university: I just went to my local university without even thinking about going elsewhere. All Swiss universities are pretty good. Even if you don’t go to university, which is the case of about 70% of each age cohort, you can still make a very good life thanks to vocational education. I have friends in the UK who have children, and I am amazed by how complicated it is early on to select the right school for your children. If you don’t put them in the right primary school, they then might not get into the right secondary school, and then not get good enough A-levels and then they won’t go to the right university, and then they’ll basically fail their life. Even if you’re a good student, you won’t be drilled in the same way to go to a good university in a bad state school, and people seem to rely to a much larger extent on the shortcuts provided by school or university rankings. Sometimes I wonder what would have happened if my parents had moved to the UK instead of Switzerland, without knowing which schools are best, without being able to afford to send me to a private school or live in the catchment area of a good state school, without writing English well enough to lobby for me to go to a better school, besides not being able to help me with my homework. I probably wouldn’t have done as well because my parents wouldn’t have been able to make the right choices for me, or wouldn’t have had the money to make these choices. This is not because my parents didn’t want the best for me, but their conception of hard work has more to do with getting up early and working hard, as they have done their whole life, rather than educational achievement that they haven’t experienced themselves. In the UK 42.5 per cent of all children whose mothers were highly educated but not British were taught in disadvantaged schools. With the children of poorly educated mothers, the figure rises to 80 per cent – the worst record in the OECD. Hence, being educated but an immigrant doesn’t even offset the segregation created by school choice. need to become more comfortable with middle-class social setting such as restaurants, theatres and offices if they are to succeed. Working class families are urged to watch plays, visit museums and try middle class food, restaurants and shops to broaden their child’s life experience. This is simply amazing: as if a middle class habitus could be acquired with a few trips to the national gallery. Even assuming that children need to conform to middle-class values to perform better, working-class children are very unlikely to acquire these values if all rich kids stay amongst themselves in private schools. Now it’s no wonder that Britain has one of the lowest levels of social mobility in the OECD. For instance, in no other OECD country is the income of your parents so correlated to your own income. Only 3% of the richest 20% have mothers with no qualifications. The social segregation allowed by school choice is also one of the reasons why this huge country is run by such a small group of upper-class people with so similar backgrounds, via Eton, because that is where social networks are built, and working-class kids are excluded from them. Now the government says that it wants to rewards people who “work hard and get on”, but people who do – like my parents – without education credentials have seen their real wages fall and the major parties abandon them. This may be related precisely to so much school choice that upper class parents can more aptly exploit, either by placing their children in private schools or knowing better how to place them inthe good state schools, while children of working class parents are left amongst themselves in poor quality state schools. A strong quality public education sector seems to be a much better way to counter these tendencies, while increasing school choice seems bound to perpetuate them. This entry was posted in Uncategorized and tagged Britain, Education, social mobility, Switzerland on March 11, 2014 by alexandre afonso. With a constant supply of new low-level drug sellers entering the market and ready to be exploited, drug lords can become increasingly rich without needing to distribute their wealth towards the bottom. You have an expanding mass of rank-and-file “outsiders” ready to forgo income for future wealth, and a small core of “insiders” securing incomes largely at the expense of the mass. We can call it a winner-take-all market. The academic job market is structured in many respects like a drug gang, with an expanding mass of outsiders and a shrinking core of insiders. Even if the probability that you might get shot in academia is relatively small (unless you mark student papers very harshly), one can observe similar dynamics. Academia is only a somewhat extreme example of this trend, but it affects labour markets virtually everywhere. One of the hot topics in labour market research at the moment is what we call “dualisation”. Dualisation is the strengthening of this divide between insiders in secure, stable employment and outsiders in fixed-term, precarious employment. Academic systems more or less everywhere rely at least to some extent on the existence of a supply of “outsiders” ready to forgo wages and employment security in exchange for the prospect of uncertain security, prestige, freedom and reasonably high salaries that tenured positions entail. So what you have is an increasing number of brilliant PhD graduates arriving every year into the market hoping to secure a permanent position as a professor and enjoying freedom and high salaries, a bit like the rank-and-file drug dealer hoping to become a drug lord. To achieve that, they are ready to forgo the income and security that they could have in other areas of employment by accepting insecure working conditions in the hope of securing jobs that are not expanding at the same rate. Because of the increasing inflow of potential outsiders ready to accept this kind of working conditions, this allows insiders to outsource a number of their tasks onto them, especially teaching, in a context where there are increasing pressures for research and publishing. The result is that the core is shrinking, the periphery is expanding, and the core is increasingly dependent on the periphery. In many countries, universities rely to an increasing extent on an “industrial reserve army” of academics working on casual contracts because of this system of incentives. What I mention above is the broad dynamic that spans across a number of countries. However, the boundary of the insider and outsider group varies across countries. I can give a number of examples from different countries. In the United States, numbers from the department of education reported in The Atlantic (Figure 2) show that more than 40% of teaching staff at universities are now part-time faculty without tenure, or adjunct lecturers paid per course given, with no health insurance or the kind of other things associated with a standard employment relationship. 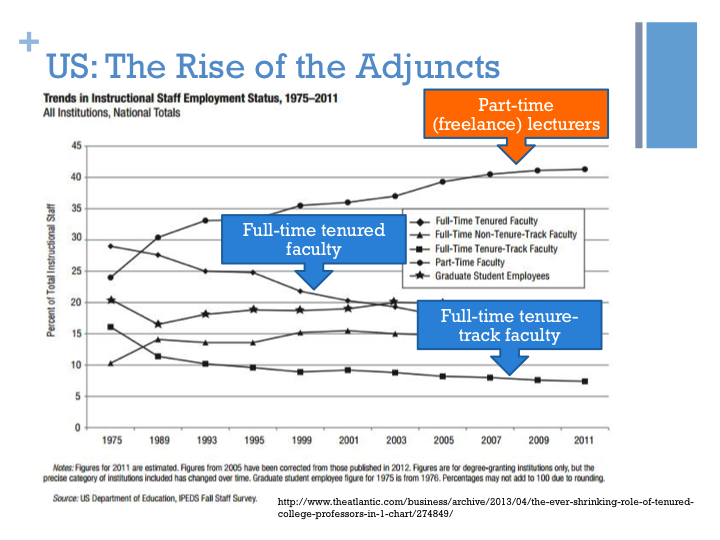 [5b] As you can see from the graph, the share of permanent tenured faculty has shrunk dramatically. This doesn’t mean that the absolute number of faculty has diminished, it has actually increased substantially, but it has been massively outpaced by the expansion of teaching staff with precarious jobs and on low incomes. The Chronicle of Higher Education recently reported about adjunct lecturers relying on food stamps. The person mentioned in the article declares a take-home pay of 900$ per month, which is sadly not that far away from the 3$ hourly rate of the drug dealer, but for a much more skilled job. 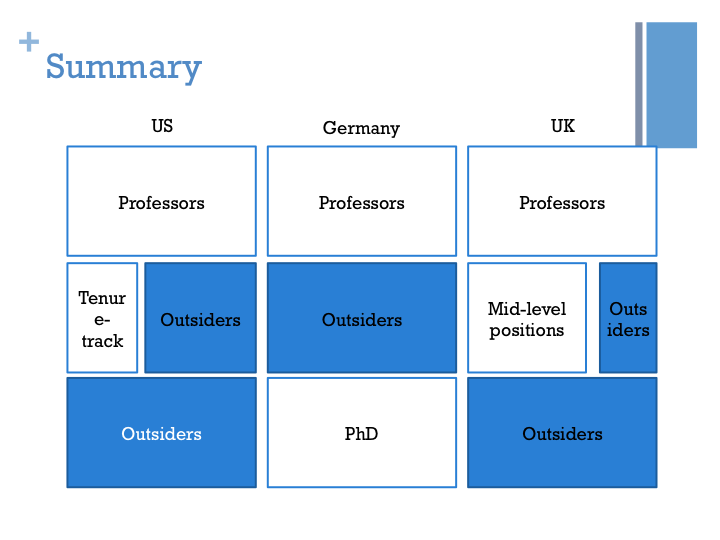 Germany is another case where there has traditionally been a strong insider-outsider divide, essentially because of the hourglass structure of the academic job market. 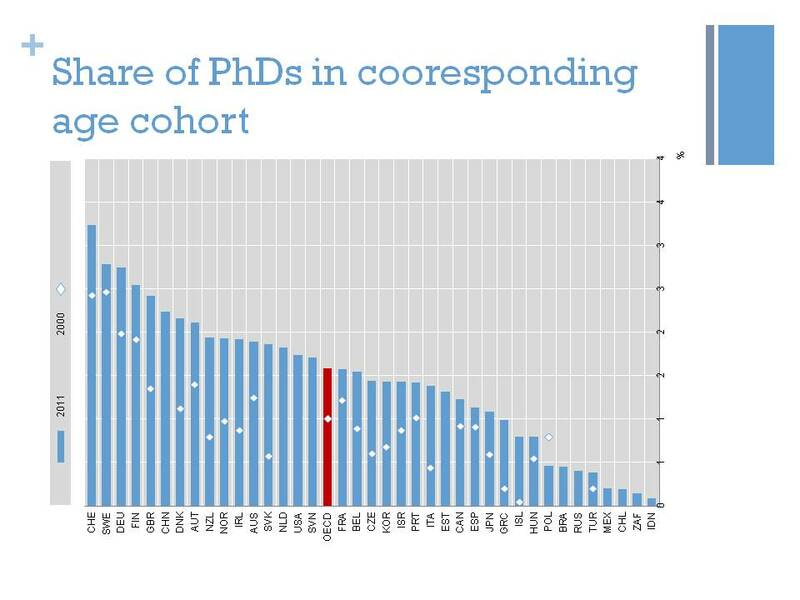 On the one hand, there are relatively good conditions at the bottom at the PhD level, and opportunities have expanded recently because of massive investments in research programs and doctoral schools generating a mass of new very competitive PhDs. On the other hand, there are good jobs at the top, where full professors are comparatively well paid and have a great deal of autonomy. The problem is that there is nothing in the middle: for people who just received their PhD, there is just a big hole, in which they have to face a period of limbo in fixed-term contracts (wissenschaftliche Mitarbeiter) or substitute professor (Vertretungsprofessur) for a number of years, after which they can hope to get their first permanent job in their mid-40s, while this could happen ion their mid-30s in the 1970s. 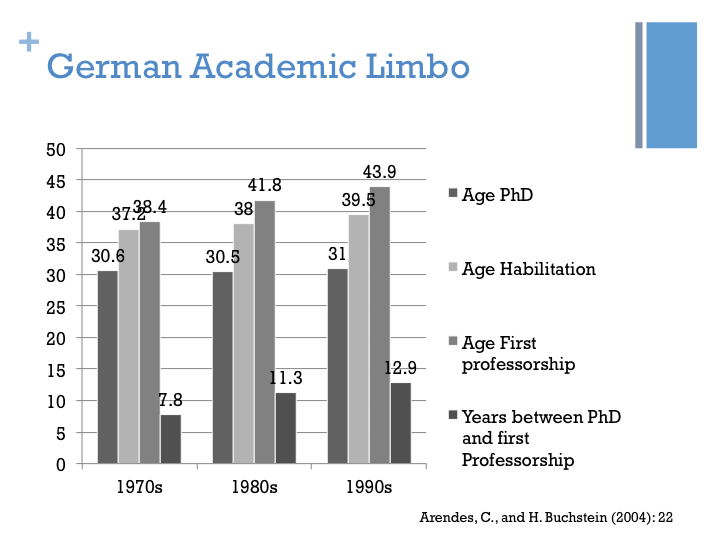 Figure 3 shows the average age of the PhD, for the habilitation and the first professorship in political science between the 1970s and 1990s. The age of the PhD hasn’t changed that much but the age of the first professorship has increased substantially. Also, you have to take into account that there is a selection effect because the people in the sample are only those who have made it to the professorship, and doesn’t take into account all of those that have dropped out during the academic limbo. What is interesting is that the insiders (professors) who control the market have often been hired at a time when no such competition existed, and you may wonder if they themselves would have been hired if similar market conditions had been in place. A number or new types or positions in the middle, such as the Juniorprofessuren have ben created, but these are also limited in time and are not the equivalent of tenure-track positions. Germany is the country of financial prudence, and both regional and federal governments have been reluctant to commit themselves to fund programs and positions on a permanent basis. This academic limbo is accentuated by the fact that in some disciplines it has become common to apply for professorships even if you’re already a tenured professor so that you can negotiate your own working conditions with your home university. The result of this is that it is very difficult for recent PhDs to compete with established professors, and hiring processes tend to last a very long time as many candidates refuse and take time to bargain back and forth. Time, you may have it if you are tenured, but you don’t if you have an insecure position. You cannot wait two years when a university is negotiating with somebody who will eventually refuse if you have fixed-term contracts. This is a really perverse and insider-oriented system. The United Kingdom is different from Germany in the sense that it does have intermediate permanent positions for people finishing their PhD. Britain is the biggest academic market in Europe and lectureships provide secure employment for relatively young academics even if the starting salary is relatively low if you take into account living costs, especially in London. However, this does not mean that UK higher education does not rely on a large industrial workforce of outsiders as well. Recently, the Guardian reported on the prevalence of so called “zero-hour contracts” at UK universities. These are contracts which do not specify the number of hours one is supposed to give, and basically imply that the workers needs to be available to her employer when there is work. Compared to Continental Europe, what is striking is the pretty dismal situation of PhD students and teaching assistants who provide quite a large part of the teaching and whose employment conditions are much more casual than what one can see elsewhere. When I did my PhD in Switzerland, I was basically a public employee with a corresponding salary, pension contributions, welfare entitlements. A large proportion of PhD students in the UK do not have regular sources of funding, need to apply here and there to get scholarships, and when they teach they are paid per hour taught or a piece rate (exam/essay marked) that can vary across and even within universities. The number of hours usually taught at UK universities is relatively moderate, at least at Russell-Group universities, because of a heavier focus on essays and independent work from students, but also partly because departments can rely on this flexible workforce. This has been accentuated by the strong constraints set on universities in terms of research and publication through the REF (Research Excellence Framework). This happens through two channels. First, as research is what is most valued, this creates incentives for established professors to retreat from teaching and secure research grants and publications instead, leaving teaching to casual teaching staff. On the other hand, some universities have advertised a number of temporary positions just because of the REF in order to use people’s publications in their submissions. There is no guarantee that universities are going to keep these people once they have “used” them. Figure 4 summarizes in broad terms the differences outlined above. As I can see it, this form of insider/outsider divide exists everywhere and is probably expanding. The interesting thing is that these divides are largely structural in the sense that the system simply couldn’t work without this large supply of outsiders ready to accept any kind of employment contract. If you are mobile, strategic and concerned with employment conditions, you might want to exploit these differences and avoid the outsider boxes at different stages of your career. This would mean avoiding the UK for your PhD and avoiding Germany after your PhD. This was presented on November 19 at the European University Institute’s Academic Careers Observatory Conference. For an updated analysis of academic labour markets in Europe, check this this paper. Levitt, S.D., and S.A. Venkatesh (2000) “An Economic Analysis of a Drug-selling Gang’s Finances”, The Quarterly Journal of Economics 115(3): 755-789; Levitt, S.D., and S.J. Dubner (2006) Freakonomics: a Rogue Economist Explores the Hidden Side of Everything. NY: HarperCollins. Emmenegger, P., S. Häusermann, B. Palier, and M. Seeleib-Kaiser et al. (2012) The Age of Dualization: the Changing Face of Inequality in Deindustrializing Societies. Oxford: Oxford University Press. [5a] NB: This paragraph has been amended to reflect more recent data. The data can be found here. Data for political scientists from Arendes, C., and H. Buchstein (2004) “Politikwissenschaft Als Universitätslaufbahn: Eine Kollektivbiographie Politikwissenschaftlicher Hochschullehrer/-innen in Deutschland 1949–1999”, Politische Vierteljahresschrift 45(1): 9-31; Armingeon, K. (1997) “Karrierewege Der Professoren Und Professorinnen Der Politikwissenschaft in Der Schweiz, Österreich Und Deutschland”, Swiss Political Science Review 3(2): 1-15. This entry was posted in Uncategorized and tagged academia, Britain, drug gangs, dualisation, economics, Germany, insiders, job market, outsiders, United States, universities on November 21, 2013 by alexandre afonso.